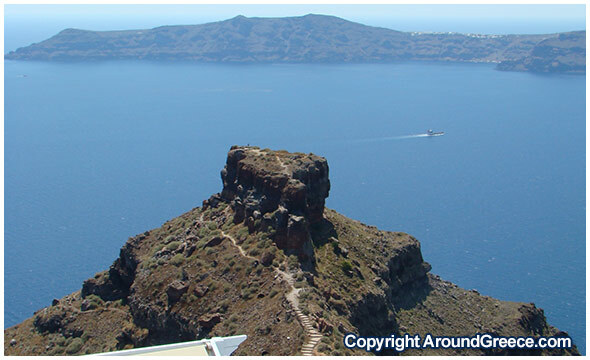 The picturesque area of Imerovigli is almost an extension of the capital town of Fira. Located right next to Fira but on a slightly higher elvation, the town of Imerovgli is one of great charm and beauty. One of the most famous parts of Imerovigli is that of Skaros, which is a large rock that sticks outwards. There was previously a castle that was built on the top of this rock, but this has since been destroyed, and only little remains of it. The geographical position of Imerovigli meant that it was an ideal watchpost for pirate ships that might have been heading to the island. Imerovigli takes it’s name from the Greek words “Imera” and “Vigla” which mean day and look out. As in the older times people had to look out all day long in case of pirates that often attacked the island. Today, Imerovigli is a very nice and peaceful town, and one that is well worth visiting. The beautiful pathways pass by the whitewashed houses and colourful gardens, and from here you can enjoy some wonderful panoramic views stretching out over the caldera. In Imerovigli you will find a great selection of accommodation including luxurious hotels and apartments.